Hey there! 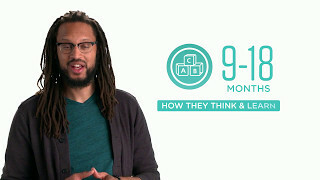 I’m Stephen Brackett, bringing you the Colorado Early Learning and Development Guidelines’ video for 9-18 months… How they think and learn! And imitating the people around her, emotionally and physically. Lead by example. Believe me! She’s watching every move you make! Let her hang out with you when doing daily chores. For example, if you’re cooking, give her a pot and some play food so she can pretend to cook along with you. Continue to read out-loud to her, even if she doesn’t seem to be paying attention. Keep in mind, a child’s attention span is pretty short at this age. Just because she wants to play or seems distracted when you’re reading to her doesn’t mean she isn’t listening. Storytime is a really important part of her development… even if she’s just enjoying the sound of your voice. To learn more about what most kids are doing from 9-18 months, check out the Colorado Early Learning and Development Guidelines at: www.earlylearningco.org. Hey there! 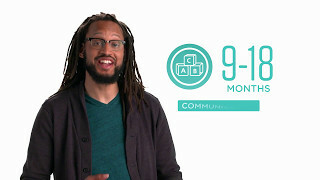 I’m Stephen Brackett, bringing you the Colorado Early Learning and Development Guidelines’ video for 9-18 months… Communication! Some of the milestones you may be seeing at this age center around your child letting you know what he wants or needs. Talk to him as much as you can. Read to him and give him picture books to explore. Talk about what you see. Language is a tough skill to master, and many of his “words” may only be understood by you or other adults who are close to him. Show excitement and pleasure when he tries to speak. You may also want to explore teaching him some simple sign language, like “hungry” and “more,” or maybe use pictures for him to point to, to show you what he wants. If you’d like more information on what to expect from your 9-18 month old, check out the Colorado Early Learning and Development Guidelines website at www.earlylearningco.org, where you can download the guidelines, find links to more resources and watch more of our videos. And remember… all children learn, grow and develop differently. If you’re concerned about your child, talk to your pediatrician. Hey there! 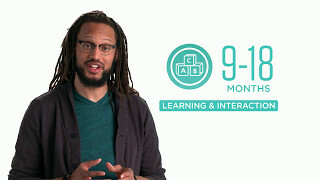 I’m Stephen Brackett, bringing you the Colorado Early Learning and Development Guidelines’ video for 9-18 months… Learning and interaction! Some of the milestones you might be seeing at this age center around learning new skills and interacting with the people she trusts. You’re also her most important teacher, so lead by example. She wants to be just like you! Make the most of this opportunity! And here’s something else to keep in mind when it comes to learning in these early years. Young children may have little to no control over their impulses. Take a deep breath and be patient. Remember to calmly and clearly explain the reason you are asking her to stop trying to ride the dog or grabbing the remote from your hands. You may also try to gently move her away or take away objects you don’t want her to have. Hey there! 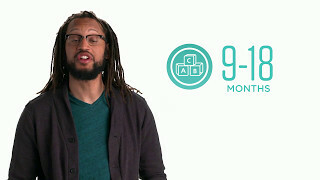 I’m Stephen Bracket, bringing you the Colorado Early Learning and Development Guidelines’ video for 9-18 months… Feelings and Emotions! From 9-18 months we typically start seeing a lot of emotional changes. Start by getting involved! The safer she feels the less anxious and emotional she’s likely to be. Establish routines that she can count on! Take along familiar toys or blankets when visiting a new place. Recognize and acknowledge her feelings. Encourage her to find ways to comfort herself. And don’t forget to hug and cuddle her! Remember, anything you can do to strengthen your bond will help her feel safer and less anxious, even when you’re not around. You also may find that you have a mini-comic on your hands. At this stage, she’ll do just about anything to make you laugh… and if it works, she’ll probably do it over and over and over again. Or, if you’re upset, she may try to comfort you. This is a great sign, because that means she’s starting to understand empathy… how other people feel and think. That’s HUGE! To learn more about what most kids are doing from 9-18 months, check out the Colorado Early Learning and Development Guidelines at: www.earlylearningco.org. Most importantly, if you feel you child isn’t hitting some of these goals then please… call your pediatrician. By working as a team, you can help your child can get all the support he or she needs. Hey there! 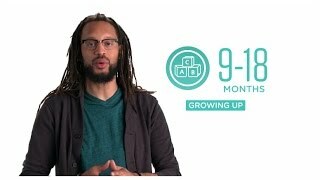 I’m Stephen Bracket, bringing you the Colorado Early Learning and Development Guidelines’ video for 9-18 months… Growing up! Most of the milestones you may be seeing at this age center around big movements! Moving independently, cruising, and using whatever surface is handy to pull himself upright. And feeding himself… sort of! Keep introducing new, healthy foods for him to try. Create safe spaces for him to practice standing and scooting around. and cheer him on as he discovers new ways to get around. Speaking of getting around… it’s really important to make sure your home is thoroughly child-proofed at this time. Things like drawers, bookshelves, cabinets, doors, stairways and outlets are all magnets to a child getting around on his own for the first time. Let him explore, just make sure his world is as safe as possible! Older babies are ready to explore their world and are becoming more mobile. They show strong attachment to the adults in their life and a fascination with other kids their age. They practice communication by babbling and they understand and can respond to a growing number of words. Creep on hands and knees or hands and feet, pull to a stand using furniture for support, cruise while holding onto furniture, or walk without support. Allow and encourage them to move to get what they want, such as a toy that is out of reach. Provide simple toys with wheels like toy lawn mowers for support as they experiment with standing and walking. Place a stacking ring on the post or use two hands to pick up a big truck, but only one hand to pick up a small one. Provide a variety of safe toys with pieces that come apart, fit together, and stack. Turn the pages of a board book. Provide books to help them develop smaller muscles in their bodies (e.g., using fingers to turn pages or point). Develop the ability to engage with adults. They may seek reassurance from parents when unsure if something is safe or watch and then help grandma as she prepares snack. Talk with them to describe your interactions. Ask if they want to help (e.g., provide a spoon and bowl to them while you prepare dinner). Join them on the floor to play. Start to understand how others are feeling. They may try to hug a crying peer or bring their own special blanket to a peer who is crying. Talk about another child’s expression of feelings (e.g., “Mia is laughing because the puppet is so funny.”). Show and talk about how you care and comfort other children (e.g., “Jake feels better when I pat his back”). Start to understand how to respond to other people. They may play in ways that involve taking turns, such as rolling a ball back and forth. Provide opportunities for them to listen to conversations and watch adult interactions. Describe to them what they are doing (e.g., “You are telling me you want me to play ball with you”). Develop close relationships with adults in their lives. They may snuggle with mom, dad or other close caregivers when feeling tired or grumpy. Respond to requests for comfort and engagement with hugs, smiles and laughter. Provide good-bye routines that are similar every time. Point to or indicate parts of the body when asked. Play naming games about parts of the face or body while holding them or while looking in the mirror. Clap and bounce with joy after making a handprint with paint. Recognize and support their attempts to do things on their own. Use comfort objects, such as a special blanket or stuffed toy, to help calm down. Seek to be close to a parent or caregiver when upset. Choose one toy when asked, “Which one do you want?” even though the child really wants both. Give a choice between two acceptable options (e.g., “Would you like to wear the blue socks or the white socks?”). Go to a cubby when their teacher says that it is time to put on coats to go outside. Label and name everything seen and done throughout the day. Play games and sing songs that use gestures and words that involve one-step directions (e.g., “Show me your eyes,” “Wave bye-bye”). Expose them to language by talking and reading together. Use both new and familiar words or sign language and repeat these words in different settings. Build a tower with the big cardboard blocks and kick it over to make it fall, then build it and knock it down again. Provide cause and effect toys, like jack-in-the-boxes or spinning tops, and toys with moving parts, like cars, and show the child how they work. Respond positively to their success in making something happen (e.g., clapping and saying, “You did it!”). Imitate simple actions that they have seen adults doing; for example, they might take a toy phone out of a purse and say hello as a parent does. Provide household items or toys that they can use to imitate adult behavior, like plastic cups, bowls and spoons, toy brooms or dolls. Go to the sink when an adult says that it is time to wash hands. Allow them to help wipe their hands and face. Bring a small stool over to reach a toy on top of a shelf, having observed an adult do it. Encourage them to solve problems. For example, say, “You are working hard on that puzzle.” Help only when they show that they need it. Anticipate and participate in the steps of a nap routine. Establish a daily schedule so they can begin to anticipate routines. Provide consistent songs or games that link to a specific activity, such as the same song at naptime or the same game prior to lunchtime.